Heart disease is currently the leading cause of death in the United States, accounting for 23 percent of all deaths. Other leading causes of death include cancer, accidents, chronic lower respiratory diseases and cerebrovascular diseases. 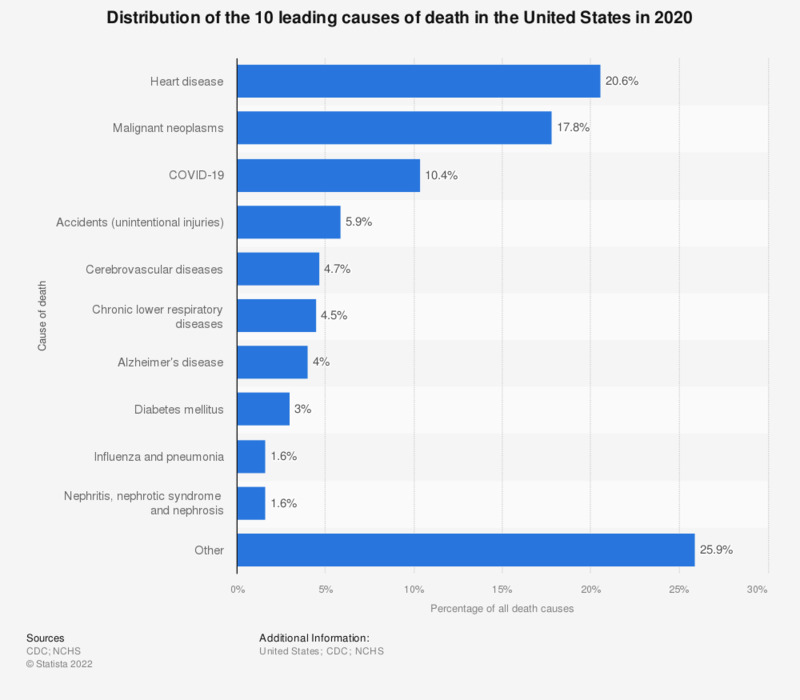 The leading causes of death worldwide are like those in the U.S. However, lung cancer, road injury, diarrheal diseases and tuberculosis are all major causes of death worldwide, but are not among the leading causes in the U.S. Instead, accidents, influenza and pneumonia, intentional self-harm and kidney diseases have a larger impact in the U.S. In the United States, there exist slight differences in leading causes of death depending on race and ethnicity. For example, assault, or homicide, accounts for around 3 percent of all deaths among the black population but is not even among the leading causes of death for other races and ethnicities. However, heart disease and cancer are still the leading causes of death for all races and ethnicities. Similarly, there are also differences in the leading causes of death in the U.S. depending on gender. For example, among males, intentional self-harm accounts for around 2.5 percent of all deaths but is not among the leading causes of death among females. On the other hand, septicemia and influenza and pneumonia account for more deaths among women than men.